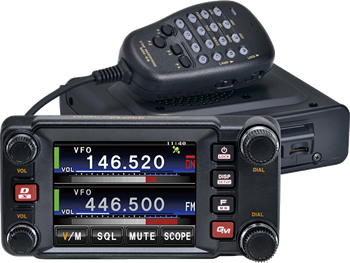 The FTM-400DR is the first mobile introduced to be a fully compatable radio partner for use on the YAESU System Fusion Dual Mode system. Compared to other digital modulation schemes within FDMA, C4FM has excellent communication quality (BER: Bit Error Rate characteristics). C4FM is the standard method for professional communication devices in FDMA, and is therefore considered to be the main stream digital communication mode in the future. Download our "Digital Communications Guide for Amateur Radio Operators" available on our web site that explains more about this efficient and reliable digital mode. The FTM-400DR performs flawlessly using both Analog FM and C4FM Digital. So there will be no loss of communications among friends who have not yet chosen to transition to Digital.